After two weeks of a sport bonanza, the London 2012 Olympics are over. I am a big fan of the Olympics and I enjoy (re)learning about all the exotic sports once every four years. As a cord-cutter, I must say I was quite worried about the Olympics this year. Will I be able to see the action? My heart skipped a beat many a time at the thought of watching the highlights on YouTube two weeks after. But I didn’t need to worry. While I don’t have any cable or satellite TV at home, I do get one channel with an over-the-air antenna, CTV, which was the primary channel providing Canadian Olympic coverage. The coverage was provided live and there was also a daily 3 ½ hour summary in prime time. But the programming delivered via my little indoor antenna was actually just a fraction of the content available free of charge online at www.ctvolympics.ca. There, I could find live coverage of virtually all events going on and a recording of every competition, sometimes a dozen of online channels simultaneously. 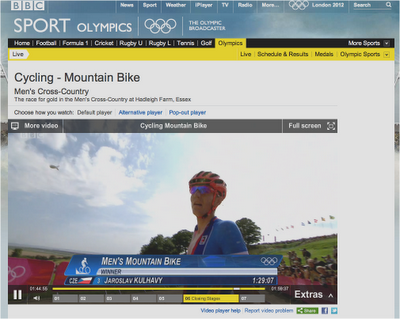 If that wasn’t enough, I was able to go to BBC’s site which provided live coverage and a recording of every London 2012 event. That was simply awesome. Sure, I was still exposed to the annoying commercials, even online, but I was able to watch everything live, in a tape delay, or on-demand! Contrast that with NBC. NBC infuriated TV viewers by airing the Olympic events only with a tape delay. In today’s day and age, it is impossible to stay away from the results and so the viewers had to watch the Olympic event while knowing the results. But what was even worse was the online coverage. NBC required viewers to sign on with their cable accounts. That eliminated all the cord-cutters like me, all international audiences, and anyone on vacation in the US like I was for a few days. Strange decision, actually, as online viewers can be a target audience for commercials just like the viewers watching on cable. 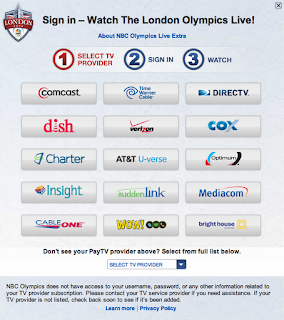 NBC online streaming required a cable account. When exposed to criticism, NBC bragged about their viewership, which was breaking all records yet again. NBC’s interpretation was that the numbers have shown that the viewers loved the service NBC delivered. Well, I beg to differ. The growing numbers reflect the rising popularity of the Olympics, the ever greater media buzz and the higher notoriety of the top athletes such as Michael Phelps and Usain Bolt. The American viewers can’t get enough of the Olympics and NBC didn’t give them any choices. So they had to watch on NBC terms. But the Olympics can be covered differently which has been shown by CTV and BBC. 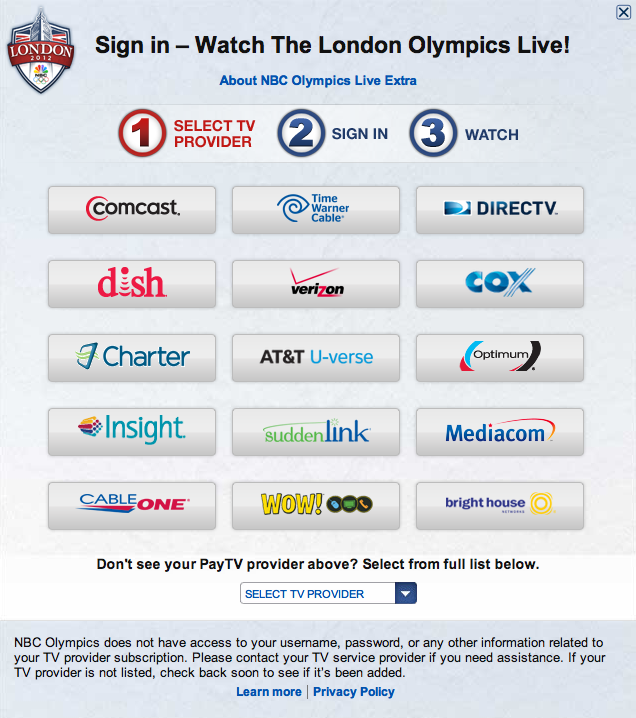 I realize that NBC paid $1.2 bln for the rights to broadcast the London 2012 Olympics coverage in the United States. That’s a huge sum of money and NBC has to be careful to make sure that they at least break even. But what I am seeing is a company in denial that is clinging on to its old ways of business while the world has moved on. Pretty soon, the US audiences will figure out alternate ways of watching their favorite programming and right now, it looks like NBC may not be a part of the picture. Just go to the BBC web site, folks. I completely agree. I'm an Olympics junkie and NBC probably missed out on an extra 10+ hours of my attention because I kept going to BBC or anything else that would give me real-time results. NBC could have sold a heck of a lot more ad time if they had done the Olympics correctly. Thanks for your comment, Hyoun. That's exactly my point! But, I have also watched the women's mountain bike race which was won by a French cyclist. Lubor, great article and I plan on sharing it with friends elsewhere. Thing is, most people who aren't connected all-day in the US didn't really notice the issue. They couldn't have watched it live if they wanted to do so and they all dived into the PM coverage. Personally, they could have shown it all the same on TV and just added live Internet coverage. That would have been an improvement. I had a real TV on vacation but poor Internet, so I didn't have the online option in the US for track. Very disappointing.